One of the best parts of summer is being able to spend a lot of time outdoors. For those lucky enough to have ample amounts of backyard space to while away your days, you may be wondering about the best ways to keep your backyard areas looking good without having to spend hours each week on the actual maintenance. 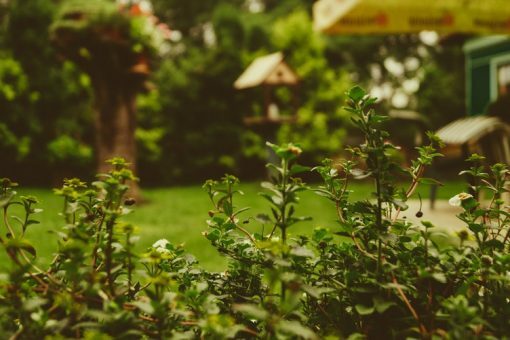 So to help you enjoy the time you have to spend outside in the summer rather than having to work so much in the hot heat, here are three ways you can keep your backyard maintained this summer. People with grass in their backyard know how much time and attention a good looking yard needs in order to stay a good looking yard. And while you might think it’s a good idea to cut your grass short so that you don’t have to cut it so often, Scotts.com recommends that you mow high rather than mowing low. When you do this, you allow the grass roots to grow deeper. The deeper the roots of your grass are, the more water it’s able to soak up out of the ground, causing you to have to water less than you might previously have done. So if your mower isn’t currently at its highest setting, consider cranking it up to help your lawn look and feel healthier. One of the hardest things to determine is how much you should be watering your lawn in the summer. In many places, summer is a very dry time, which may require you to water less than you’d like due to drought conditions. To help you see if you’re watering the right amount, Douglas Trattner, a contributor to House Logic, suggests putting out a pie tin when your sprinklers come on so you can actually see how much water is collected. Additionally, it’s better for your lawn to have fewer but deeper watering sessions rather than a lot of little watering sessions. Small sprinklings of water can cause the roots of the grass to grow shallowly, which isn’t what you want. To be comfortable when spending time outside, many homeowners have patio furniture that they bring out in the summertime. However, if you want this furniture to last more than one or two season, you’re going to want to cover it. According to ImproveNet.com, all the fluctuations that happen during summer weather can really deteriorate the integrity of your outdoor furniture. But by protecting it with a covering or taking it into a roofed area when bad weather strikes, you can save yourself from having to replace your furniture before you intended to. If you want to have your best summer yet, consider using the tips mentioned above to help you keep your backyard enjoyable all summer long.